Cool Coops — Fasse bldgs. As we continue improving and developing Fasse bldgs.' modern luxe Tonbo Meadow development, there have been ongoing talks of a community chicken coop in the near future. We have also had custom home clients interested in testing their urban farming skills with a backyard chicken coop of their own. At Fasse bldgs. we refuse to settle for anything less than a cute coop! Before taking a look at some rad chicken dwellings, I just want to touch on some of the benefits of 'farming' your own backyard eggs. Fresh eggs from your own backyard chickens are the best quality eggs you will ever eat. Besides the freshness factor, raising your own small flock of chickens has many more benefits than most people realize. According to Backyardeggs.com, "eggs from chickens allowed to forage naturally, have on average, seven times more beta carotene (which is what makes pastured egg yolks so orange), three times more vitamin E, two times more omega-3 fatty acids and two-thirds more vitamin A than factory farm birds." Not to mention your eggs will be free from chemicals and hormones. And for everyone who've ever said eggs are riddled with cholesterol — backyard eggs contain only about half as much cholesterol as factory farmed eggs. Take that egg haters! Now here are some lucky hens! Cocorico by Maxime Evrard is made up of an egg-shaped housing compartment connected to a covered mesh area for play and scratching. 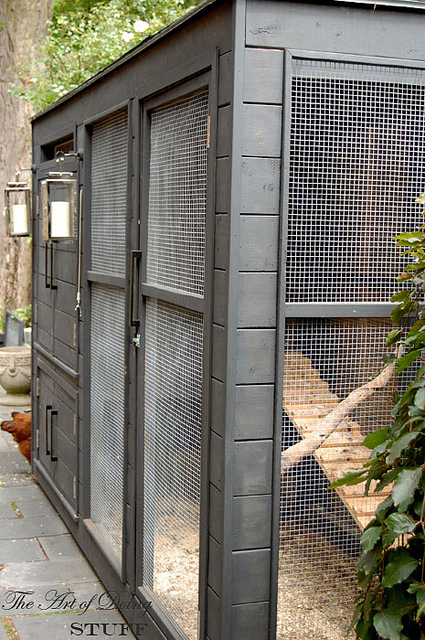 This is a stylish and interesting design for urban chicken owners with just a handful of hens. This cool coop is by David Rosen, an Associate Producer at CBS News in New York. His goal, in addition to sheltering four egg-laying hens, was to design a structure that complemented his house, a modern barn in Rockland County. This egg-shaped sculptural coop houses 2-4 chickens. According to the Nogg website, "the nogg sits beautifully in any garden, urban or rural environment and is designed to enhance and compliment it’s surroundings." A product of William-Sonoma, this transitional coop is hand built from sustainably harvested western red cedar, custom milled by a local, family owned sawmill. For the space-conscious poultry farmer, this coop includes a rooftop garden to shade the chickens when they're in their spacious 25-square-foot run. 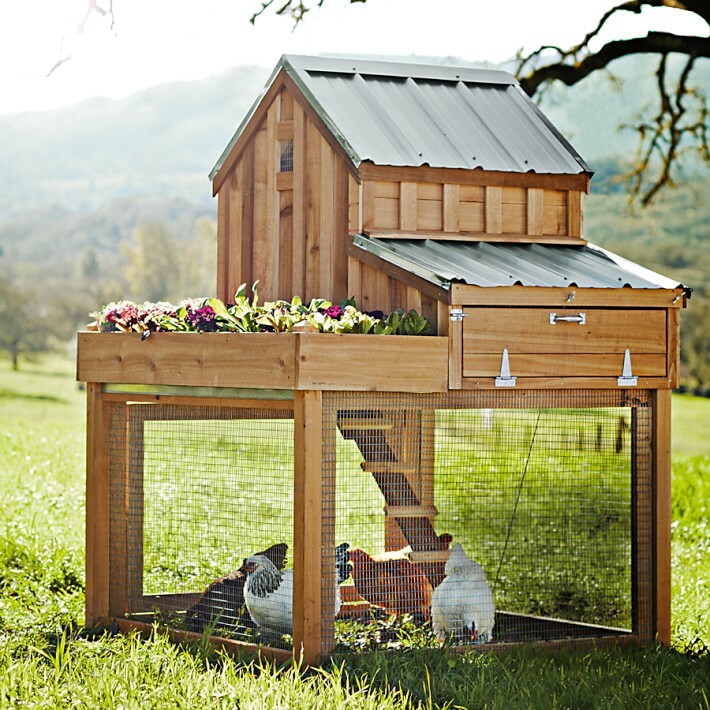 These sporty chicken coops were featured on moderncoops.com, and are made from recycled cedar with durable metal or fiberglass roof panel and an extra large side access door for cleaning. The entire coop is made to be mobile. It moves around the yard to give the chickens fresh ground for scratching and allows for you yard to re'cooperate'. 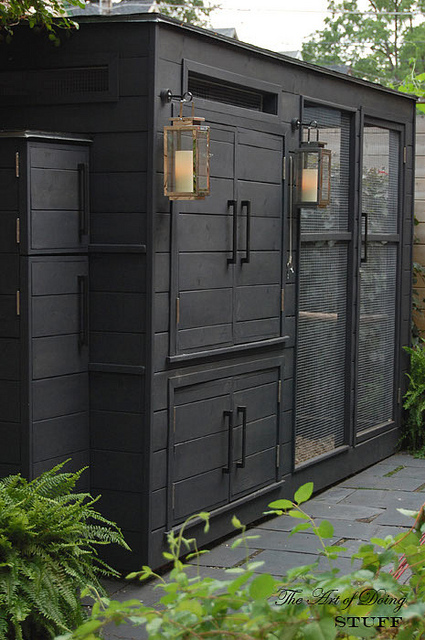 This classy coop was a custom project I came across on theartofdoingstuff.com and I instantly fell in love with the look! The box attached to the left side of the coop houses the exterior nesting box on top (which the chickens have access to from inside the coop) as well as storage in the larger door below. And the black exterior paired with gold tone light fixtures on the outside...LOVE! Elegant housing for urban chicks! This coop from Raad Studio designed this easy to assemble coop comes with solar panels on top help circulate air through the coop, which contains storage space for bedding and food, a perch for roosting, four laying units and a slide-out chicken run. Like an apartment building for chickens, Breed and Retreat by designer Frederki Rioje elevates hen houses off the ground in a stacked configuration with private ‘rooms’ and a large glassed-in egg-laying area. According to Frederik Roijé, "designing a special place will give nature its space. Even in urban society." The UK based, Omlet created the cute, colorful EGLU, designed to house chickens or rabbits. According to Omlet, "Eglu is designed to be the house that chickens [and rabbits] themselves would choose.” They are cozy and well-protected, but each offers a nice long caged-in run in which to play and enjoy the outdoors without being exposed to predators. Each Eglu features a removable lid for cleaning, a pull-out tray for droppings, a top-mounted door handle and a reach-in ‘eggport. This hen house comes complete with a native-landscaping green roof to merge the aesthetic of the chicken abode with its natural surroundings. The coop has two perches made from tree branches on the inside, and easy exterior access to its two laying boxes. 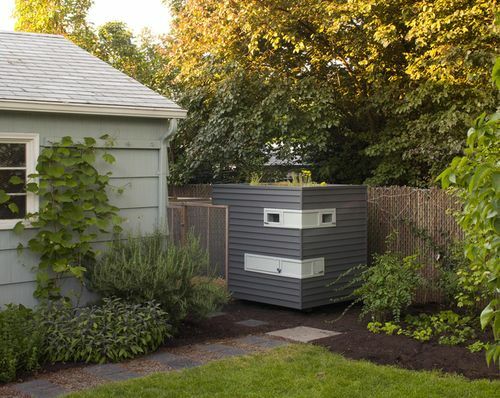 Designed by Brooklynite architects Mitchell Snyder and Shelley Martin after they moved to Portland and began having some success in their garden. Trendy chicken coops are part of a growing trend, in which city dwellers are striving to live sustainably in an urban environment, while also remaining stylish. Fasse bldgs. loves this progression and I hope this post has help put the chic in your chicken coop!